The Cinque Terre is a spectacular coastal area in the north of Italy that encompasses five charming little villages located at the base of the Cinque Terre National park. The park is a UNESCO world heritage site that strives to work in harmony between both tourism and nature. The Cinque Terre is known for it’s stunning panoramic views that will literally leave you breathless and for the famous hiking trails offering the best viewing points looking out to each village. To really get the most from this area one should really explore the Cinque Terre by foot. So pull on those hiking boots and walk the famous Cinque Terre trail. The Cinque Terre hiking trail is a very popular walking track between the villages and is some 11km long. We walked this trail in the midst of summer and found the walk took us all day. But of course we stopped and lingered at each village to explore and refuel with something scrumptious to eat and drink! It’s best to be prepared before you start the hike and depending on what season you are going, some essentials are required. First of all grab a map from the local tourist information centre or from your accommodation. Most hotels will provide information about the region including maps of the hiking path. If you are hiking in summer then it’s necessary to wear light clothes, a hat, take some sunscreen and some bottled water as it gets extremely hot with the direct sun beating down on the hillside. There are two hiking trails, the high route and the low route. The low route (Blue) is the most popular trail as it follows the coastline and this is where you would have seen the many spectacular photos taken from. In order to maintain and protect the environment of the National Park, you will be required to buy a Cinque Terre hiking card in order to use the trail. These are available for purchase at the booths leading to the path and currently costs 6 Euro. There are also family discounts available too. We chose to start at the most Northern village of Monterosso al Mare, as that was where we had booked our accommodation. The other option is to start at Riomaggiore which is the most Southern of the five villages and begins with a flat path. The most spectacular views are when you are walking from Monterosso al Mare towards the other villages. If you start the other way from Riomaggiore you will be looking back at the view. After the devastating floods and landslides in late 2011 some parts of the trail were closed. We walked the trail in 2012 and the trail between Corniglia and Manarola at that time was closed. So we had no other option than to get on the train for this leg of the journey. It has now been re-opened the whole way, with all villages accessible from the walking track. Please note that tracks can be closed at anytime if it is deemed to be hazardous and this can be particularly so during the winter months. This part of the trail between the villages of Monterosso al Mare and Vernazza is about 2.5 km long and it will take you about 1 hour and 45 minutes to complete depending on your level of fitness. Don’t be fooled by the fact that the distance is only 2.5km away, as this section has many steep uphill steps and weaves its way in and out of the rugged mountains. The track is not that well made, and you will need a decent pair of shoes. Having said that, you will see many people wearing flip flops in summer! My travelling companions had worn casual thin soled shoes and sandals and found that some parts of the track were a little hard on the feet due too the many rocks and stones in the ground. This section of the track is the most difficult stretch of all the villages. If walking this track in summer then I would start earlier in the morning to beat the sun as it does get very hot. The stunning view you see in a lot of pictures is located between Monterosso al Mare and Vernazza. We noticed along the way that there were people of all ages walking this part of the track, from the more mature age to families with little children. If you feel you can’t walk the whole track then there is the option of taking the train that runs between each village if you need to. The views along this part of the track are stunning, looking out to the ocean the water shimmers in the sun, making it look an iridescent blue. At points, the track moves inland where you will see lots of terraced gardens, vineyards and olive groves. I highly recommend that you walk this section rather than take the train. So we finally reach the tiny village of Vernazza and my party and I are quite relieved that the hardest part of the track is complete! Time for a rest, a cool drink and then a wander about the shops of Vernazza. This part of the track between the villages of Vernazza and Corniglia was not as strenuous as the previous leg but none the less it weaved inland and also involved some up and down climbing. The hike between these two villages also takes on average 1 hour and 45 minutes. It was on the way between these villages that we came across two cats that were sleeping on a bench. On the bench was a tub with a sign on it asking for passersby to feed the two homeless cats from the tub. They looked very content as they were sleeping so we let them be. Once we reached Corniglia, the only village that does not go down to the coast but sits high on the cliff top, we decided to stop for lunch and found a delightful little Piazza. The piazza was alive with people in the busy summer trade, enjoying their day just as much as we were with a lovely meal and a local wine. We then wandered around the village a little before it was time to move on to Manarola. The path between these villages were closed and we did think about taking the alternative path but it was extremely hot and we were unsure where it started, so we decided to take the train instead. Normally this part of the track also takes on average around 1 hour and 45 minutes. The path between Manarola and Riomaggiore is paved, flat and will take you an easy 20 minutes to walk. The path has been called Via dell’Amore or the lovers walk and named so because of its scenic romantic view. Located on this path is a lovely restaurant cafe that takes in the stunning views. I can certainly imagine with a magnificent backdrop like this one, that there have been many marriage proposals happening in that little restaurant! Keeping on the theme of love, as you walk further along towards Riomaggiore, you will find the lovers seat in a covered terrace. There are lot’s of tourists taking photos sitting on the seat with the ocean view in the background. The walls of the terrace are also covered in graffiti, with peoples declaration of love for each other or for those who don’t have a love … a declaration of a love for Italy! Once we reached Riomaggiore we wandered around marvelling at the village, purchased some gelati ice cream and then walked down to the sea level to sit, relax and take in the final view. Just magic! The photos below show different sections of the walking track between the villages. The guides all say the walk will take you around 5 and a half hours and if you only do the walk without stopping then yes this will be the case. But you will spend some time in each village and then stop for lunch. Basically you will be on this walk all day. If you are short on time then I suggest that catching the train will be the best option. If you are wondering whether you are fit enough to do this hike, I say just go and do it! It’s an amazing experience and if you start early you can take it easy with a slower pace. The rewards are the spectacular views like no where else in the world. This really is something special and a must for the bucket list! I haven’t been to Italy yet, but when I do go I want to do this walk.Such beautiful views! Great photos, Wendy. Thanks for your compliment Connie. The Cinque Terre is a beautiful part of the world, definitely a must do when you go to Italy! I was hiking along the Blue Trail too and I loved it. The view is spectacular and the villages are unique. I wrote a post about it on my blog too. (My favorite village was Vernazza by the way). Absolutely agree Christina – a fantastic part of the world and I would love to go back and do it all again! I loved Vernazza too, actually I loved all of them! I love, love, love all of Cinque Terre. My favorite was jumping off cliffs/rocks at Manarola, and that “love trail” is super cute. It’s also one of my favourite places (after the Amalfi coast), truly stunning. I wasn’t brave enough to jump off the rocks when I was there as the sea was really rough but others were braving it at the time. Did you write on the love wall? Gorgeous photos!!! 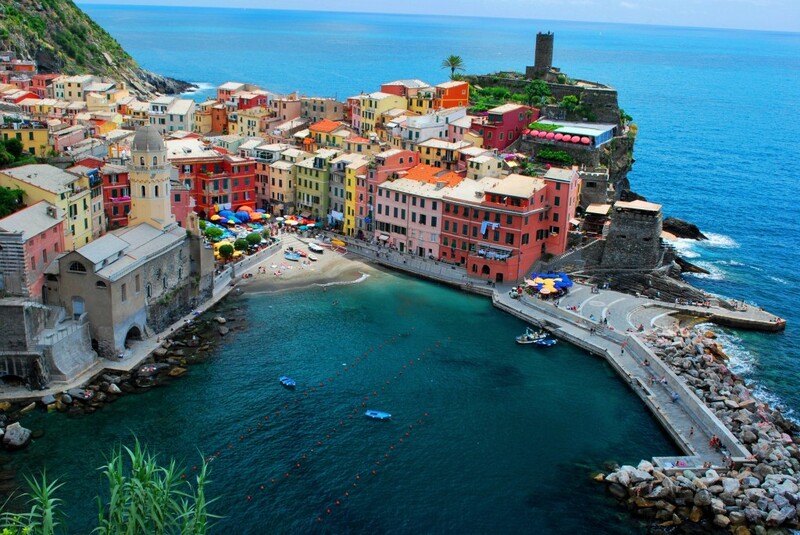 I would love to visit Cinque Terre one day. I’m not usually a big walker to be honest (unless it involves shopping 😉 ) but this hike just seems too beautiful to miss. Thanks so much Pearl, you should definitely go as it’s fabulous! Yes the walking part of the first two villages is a little challenging but the view is worth it. I have just got back from Cinque Terre and this brings back the wonderful (and painful from all those stairs) memories! Such a gorgeous place! Love this! What an amazing and beautiful trail! It has all the elements any hiker would enjoy! Thanks so much for sharing!